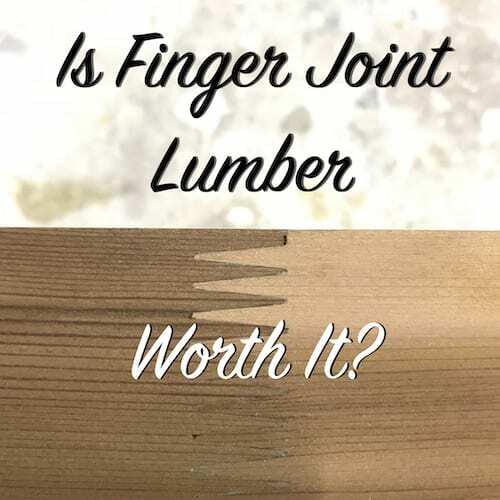 Is Finger Joint Lumber Worth It? We all want cheaper lumber, right? Well, you may not want “cheap” lumber, but you certainly don’t want to pay any more for your materials than you have to. And that’s where finger joint lumber comes in. While it can save you a lot on your lumber and molding costs it may not be the best choice for your project. Finger joint lumber was the lumber industry’s way of creating the long pieces of wood that we need for non-structural things like trim and casings. Sure you can buy non-finger joint versions which are usually called stain grade, but they cost a lot more than their finger jointed cousins. Why? How is Finger Joint Lumber Made? Wood manufacturers take some left over lengths of wood that are too short to use anywhere else and cut the ends of them with a finger joint profile. 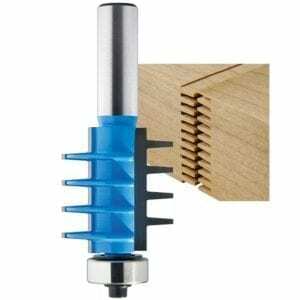 It’s not complicated, you can make your own finger joint profile with a finger joint router bit if you wanted to. It’s a great way to make a piece of wood extend to almost any length by adding more and more pieces to the end. The finger joint is then glued with a wood glue or other adhesive and clamped together to cure. Once the glue is cured and the clamps are removed you can sand or plane the wood smooth so that the joint lines up perfectly and once painted the joint is usually invisible (for a time). Finger joint lumber is cheap because the manufacturers can use small lengths of leftover wood to assemble full length of moldings. That equates to cost savings sure, but what does it do to the performance? This is just my opinion from working around the stuff for years. Sometimes I’ve installed it myself, but more often I’m the one removing it when it fails. It can work well, in larger pieces when there is ample gluing surface to help hold the pieces together, but it still has one fatal flaw. Wood moves. Wood expands and contracts in response to the conditions in the environment around it like heat, cold, and moisture. The problem with finger joint lumber is that every piece of wood moves differently and the piece of wood on one side of the joint vs. the other side will almost always expand and contract at different rates. This results in the joint weakening and pushing apart over time. Even if there isn’t failure of the joint the expansion and contraction often results in the joint projecting through the paint where it can be clearly seen. Can you say, “ugly”? Joints like in the picture at the top of this post tend to perform best because of the large glue area, but small finger joint moldings like door stop, cove molding, quarter round and other similar items often don’t even have the strength to survive transport from the store to the job site. Should You Use Finger Joints? I certainly won’t yell at you if you do. NOOOOOOOOOOOOO!!!! Just kidding! Finger joint lumber should never be used for anything structural or exposed to the elements, but if you want to save a little to put some new casings in your closet then sure go ahead. Just be aware that you get what you pay for and it is much cheaper than solid wood. What does that tell you about the quality you are getting? The post Is Finger Joint Lumber Worth It? appeared first on The Craftsman Blog. Previous Post OSB vs. Plywood: Which is Better?